The following are guidelines and specifications for the application of the City of La Vista’s logo, colors, and graphics. These guidelines are meant to promote a consistent look and feel in all of La Vista’s communications - a look and feel that supports La Vista’s new brand vision. 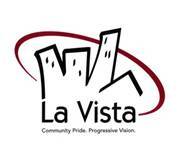 All use of the La Vista logo is subject to the control of the City of La Vista. Usage of the La Vista logo must be approved prior to display. Always maintain a minimum clear space around the La Vista signature to preserve its integrity. This clear space isolates the signature from competing graphic elements such as copy, photography, or background patterns that may interfere with the clarity of the signature. Keep a distance no less than the height of the letter “V” in the word “La Vista” of the logo at all times. See diagram to the left. Most La Vista projects will be printed in 2 colors: PMS 201 and Black. In some cases, specified tints of these colors can also be used. Never re-typeset, re-create, or alter the La Vista logo in any way. Any change made to the logo will cause inconsistencies with the brand image, ultimately diluting its impact. To maintain consistency, use only approved digital art files. Delete the swoosh from the logo. 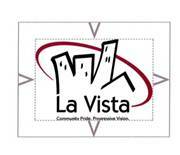 Change the proportions of the building in relation to the La Vista wordmark. Use any colors other than black and PMS 201. Place the logo over images without sufficient contrast. Use the logo over a dark color. Use a gradient in the logo. To achieve a unified and consistent look across all La Vista communications, one dominant typeface should be used: Avenir. Only the weights and italics specified here are to be used. Logo Typefaces: The La Vista wordmark is Kabel Medium. The tagline is Avenir. Minimum Size: Minimum Size for reproduction with tag line is 1.25” wide. Minimum Size for reproduction without tagline is 1” wide.